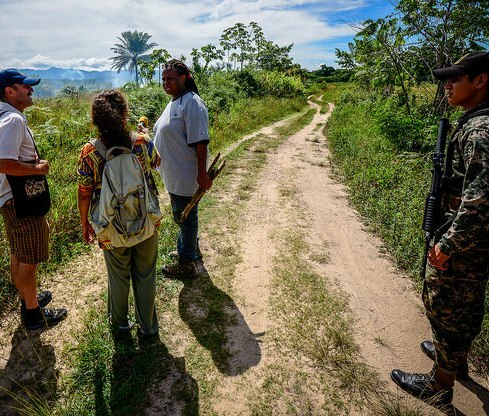 Part V: Vallecito: Contested Sanctuary for Garifuna Cooperative, Lands for Resettlement, Indigenous Agri-Cultural Educational Center. The Vision and the Step-by-Step Realization of that Vision. 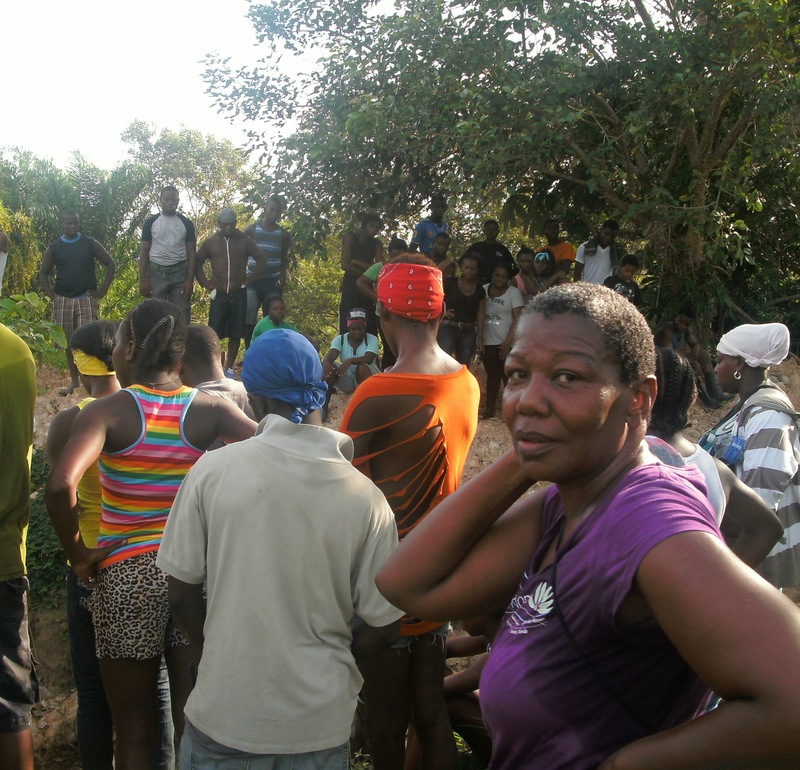 Garifuna Encampment, Cultural Resistance. (Lombardo Lacayo is a founding hero of OFRANEH). Photo by Steve Pavey. 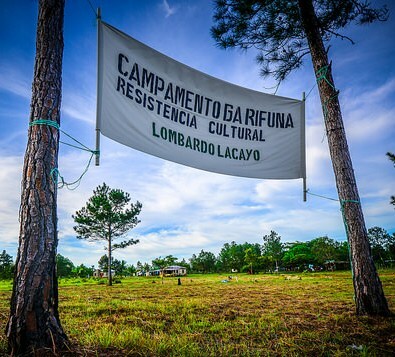 The recovery of Vallecito began in August of 2012, with a mass encampment determined to push for the resurveying of the land by the National Agrarian Institute (INA). Paramilitaries in the employ of the Narco Trafficker who had invaded the lands shot off their automatic weapons for weeks on end in an attempt to intimidate the Garifuna, but the Ancestors had been summoned by the ceremonies and drumming and dances continued into the nights, day after day, and night after night, as national and international solidarity (among them Ag Missions) applied pressure to the Honduran government to provide security so that the surveying could proceed. 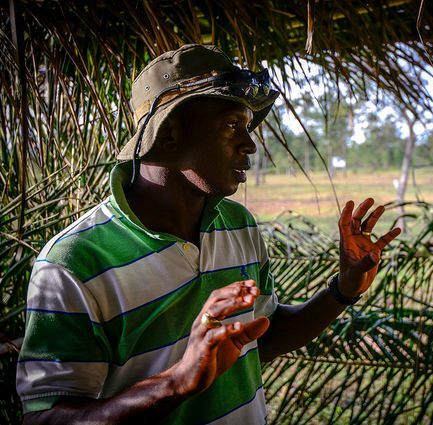 And it did proceed, finally, and the INA confirmed what everyone knew already: the land belonged to Garifuna cooperatives, all 2,500 acres of it. In 2013 Ag Missions co-organized a gathering in Vallecito attended by 250 people representing six indigenous delegations, a US contingent and a Salvadoran delegation organized by Ag Missions, to learn more and to help OFRANEH consolidate their land recovery. On this occasion more than a year later our delegation arrived in Vallecito in the dark after many hours journey from the far east of Honduras, after skirting sand dunes and driving dangerously into the surf to cross the mouth of the Iriona river. 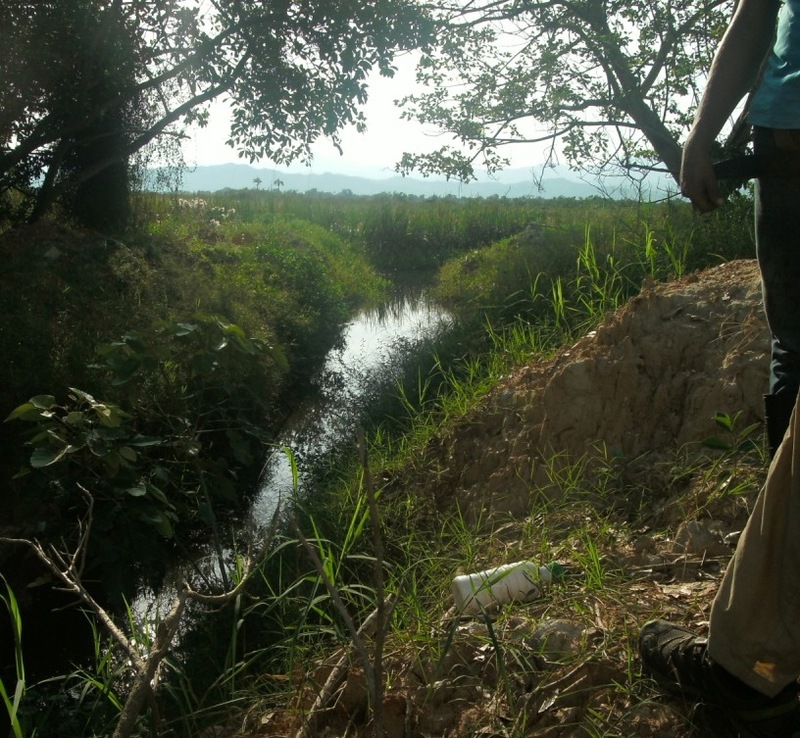 We had crossed through Garifuna communities such as Tocamacho, Cusuna, Punta Piedra , Sangrelaya. 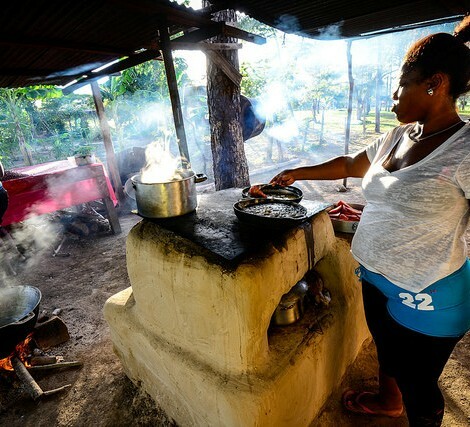 Supper was being served, and a generator was running so there were a few lights on in the outbuildings that have come to represent a new project of hope for the Garifuna people. Many young adult Garifuna were present, 60 we learned the next day. We set up our tents by flashlight as the drums and cries and banter of youthful fun resounded into the humid darkness, and settled in to be part of a Rural and Urban Youth Agriculture Brigade. In the morning, we were awakened by calls to work crews and headed out to see how we could participate. 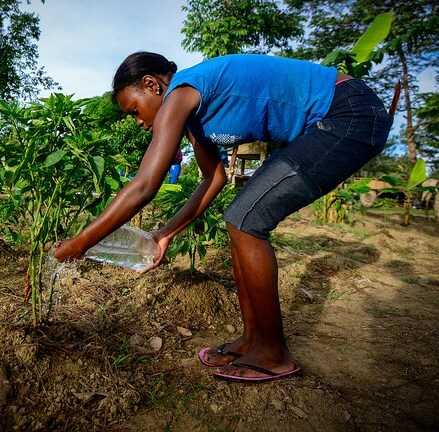 A youth Brigadista waters sweet chile pepper plants in the Kitchen Garden Field. Photo by Steve Pavey. Several brigades had spent time in Vallecito in the past months and I could see a lot of progress had been made. The large kitchen garden was the most visible, close by the outdoor kitchen and food supply outbuilding and protected behind a barbed wire fence. In that garden were planted plantains, cassava, chiles, sweet potatoes, pineapple, squashes, lemongrass, and there was a cluster of sprouted coconuts ready for transplanting. In front of the kitchen garden, conveniently located under the raised cistern, was a tree nursery, where mahogany and other reforestation trees were already developing into saplings. 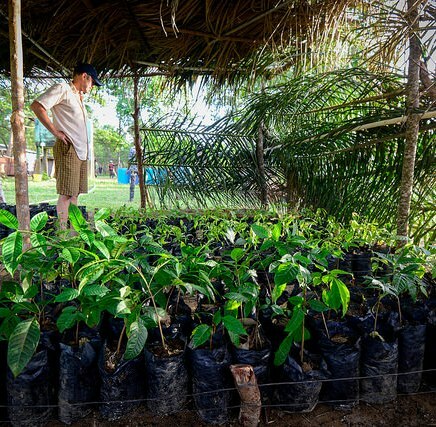 A workshop organized by the official Vallecito agronomist and trainer Henry Morales advanced the work in the tree nursery. 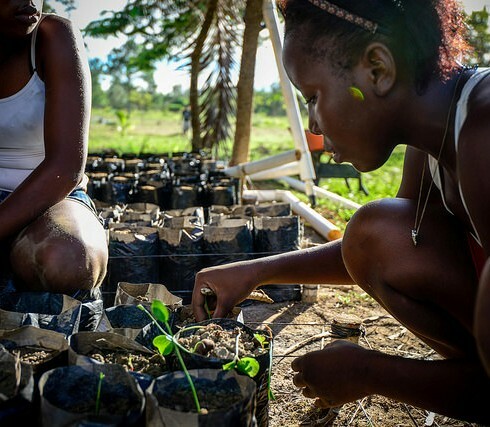 Youth in the brigade learned to prepare a good soil mix for the plastic starter bags and to prepare sprouts for various beach dwelling fruit species to be planted in those starters. 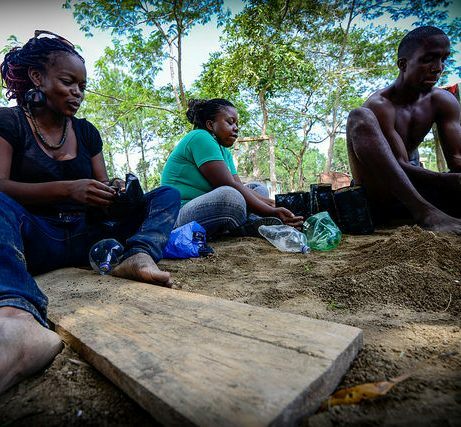 Young adult Brigadistas prepare plastic starter bags with mix of sand, compost and soil. 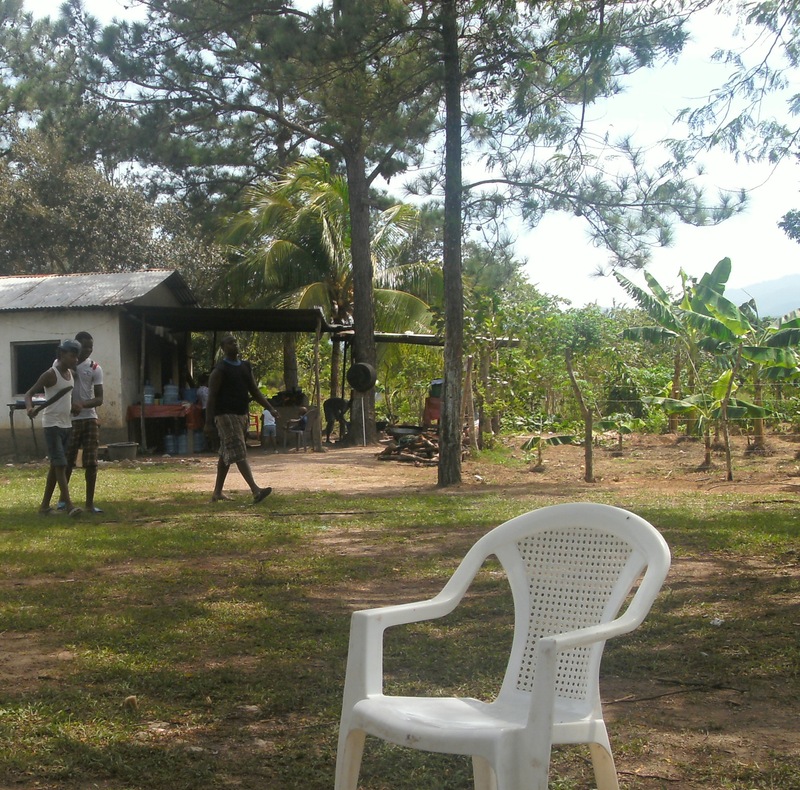 After work sessions, the Brigadistas return to camp for meals, where a crew of cooks keep busy feeding the field workers. 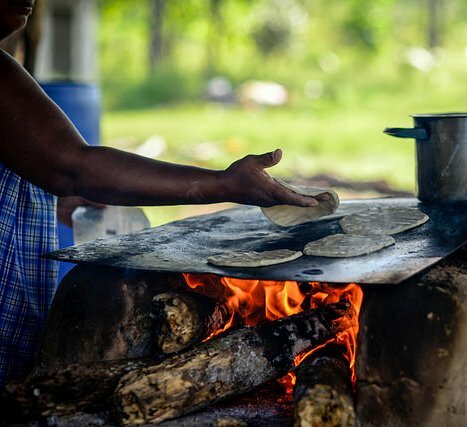 Wonderful wheat flour tortillas were a staple in Vallecito. Photo by Steve Pavey. To slake our thirst I split a coconut we were given in Batalla, a variety called “tanque” or “tank” because of how much coconut water there is inside. 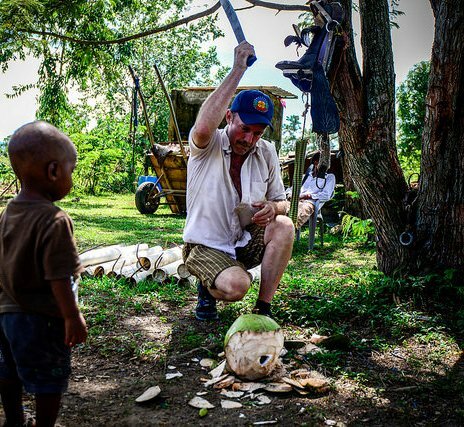 It is one of the few that is resistant to the lethal yellowing disease that has wiped out so many coconut groves in Honduras. 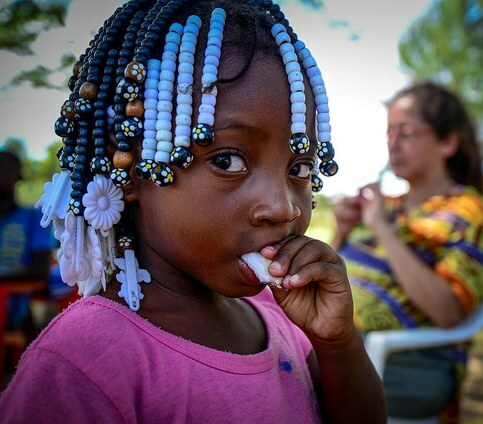 The daughter of a Brigadista enjoys some fresh soft coconut meat. 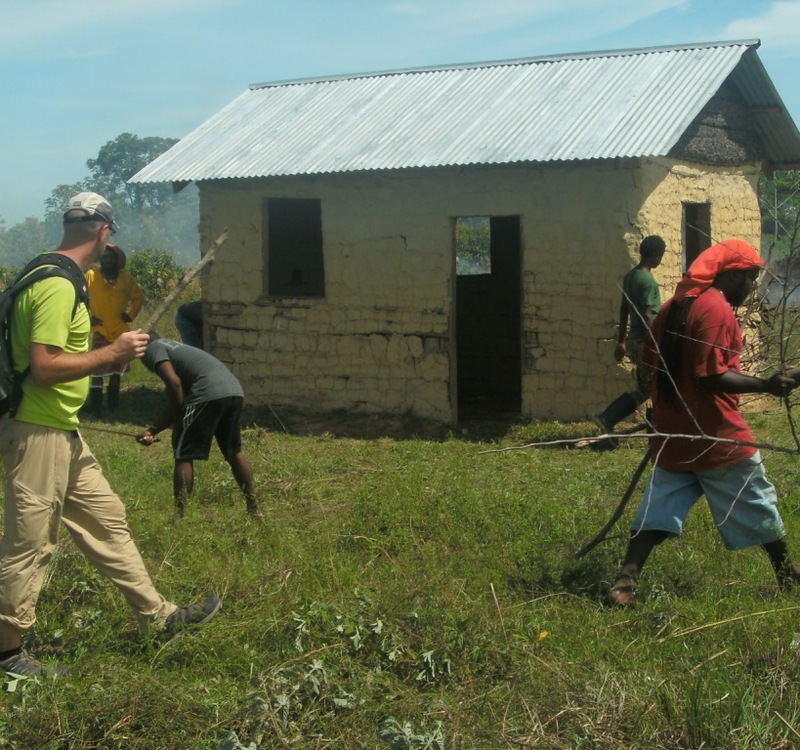 The next morning is time to inspect the beachfront lands of Vallecito, so OFRANEH organizes a long walk there. 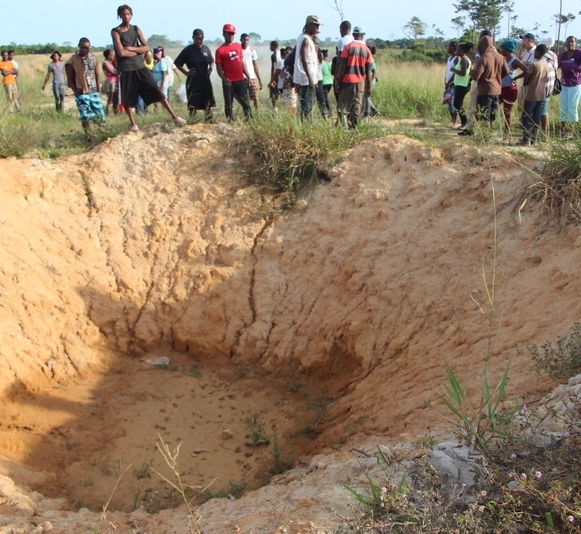 The former landing strip used by the Narco Traffickers had been damaged by the army last August who dynamited craters. Campesinos evidently in the employ of some Narco attempted to fill in the craters using pine logs. It was when this was discovered that Miriam Miranda and other OFRANEH leaders were nearly kidnapped. Since that time Miriam has been assigned a security force as she has been issued a protective order. 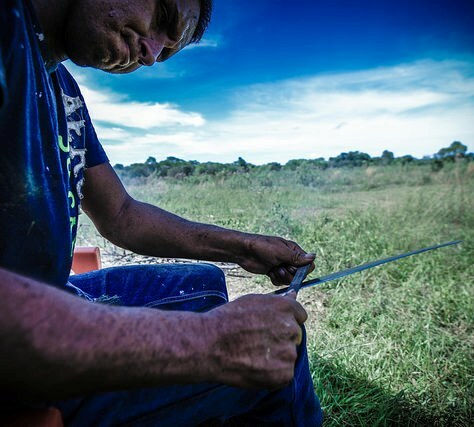 The inspection of the lands near the beach reveal that the Narco’s have brought in machinery to dig a creek for clandestine boat entry. And in addition large areas have been plowed and planted in a variety of crops, including corn, beans, rice, tomatoes. 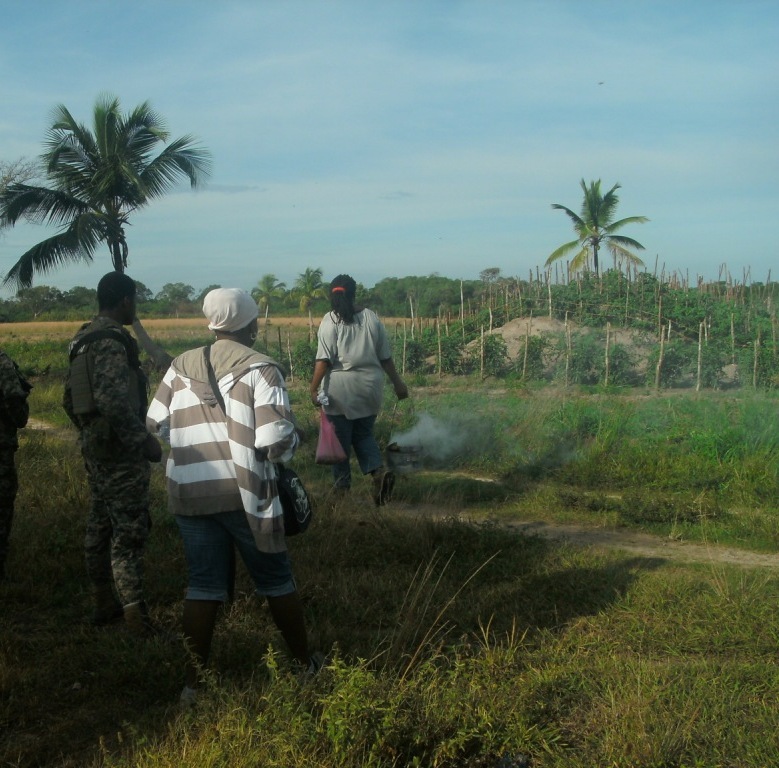 Inspection of Garifuna beach front lands. Danita Nelson of AMI delegation in foreground. Understanding the forces behind the continued occupation of the Garifuna lands, OFRANEH must now take the fight back to the Honduran capital of Tegucigalpa and the Institute for Agrarian Reform to push until they complete the procedures of land recovery that their land survey initiated, including the eviction of the invading settlers in the pay of organized crime groups, individuals or families. The effort to resettle this land in Vallecito is making strides. Many of the gates built by the Narco invader have been removed. 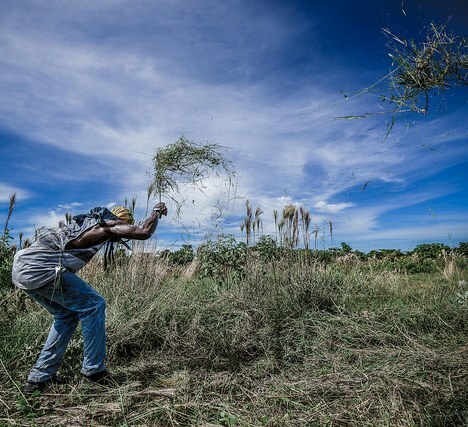 Agricultural production is expanding, including a whole acre of land planted in plantains and other staple foods, using sustainable practices designed to maintain soil fertility. 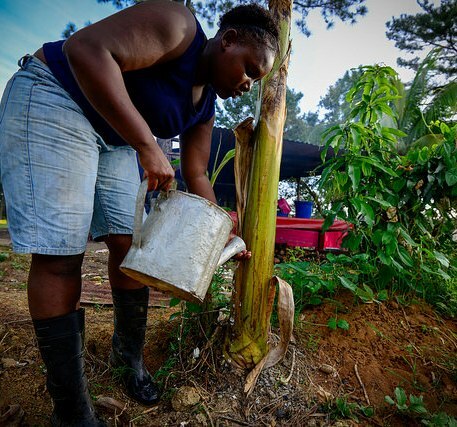 The youth are being engaged and trained to tend to plants and to live off the land, with rural youth in a leadership position with their urban peers. In the final photo essay of this series, Part VI, we will address the big picture being envisioned by OFRANEH leadership and how Vallecito fits into that picture. ← Garifuna communities in Trujillo and Puerto Castillo endure collective displacement, fisheries contamination, threats to fresh water.